Some people have been asking me what would be a good meal to serve to introduce their family to a meatless meal. This would be a good recipe because it has a meaty texture and tons of flavor. If you have followed my blog for any length of time you know I am very fond of Mexican/Southwest food. This plant strong,Tempeh Tamale Pie satisfied my desire for Mexican food and gave us leftovers that were equally as scrumptious the next day. That’s a win-win in my book! This amazing recipe comes from Mama Pea and you can see her original recipe here. I tweaked it to my personal likes and was very happy with the results. Please note that hubby Tom had to have two servings to fill him up. One was plenty for me with some romaine lettuce and salsa on the side. This is a great dish for kids! Here is a link to a post Mama Pea did about how to turn 5 Basic Vegan Recipes Into 25 Different Meals. If you are just starting out eating a whole foods plant based diet or are in a rut about what to cook – regardless of what food plan you follow, her post is inspiring and might just get you enthused about getting back in the kitchen. If you are like me you might be saying what the heck is tempeh? A few months ago I had no clue what it was or how to use it. According to About.com – Tempeh is made from cooked and slightly fermented soybeans and formed into a patty, similar to a very firm veggie burger. Many commercially prepared brands add other grains, such as barley, and also add spices and extra flavors. Although tempeh is made from soy, it has a unique taste and is mildly flavorful on it’s own, unlike tofu. 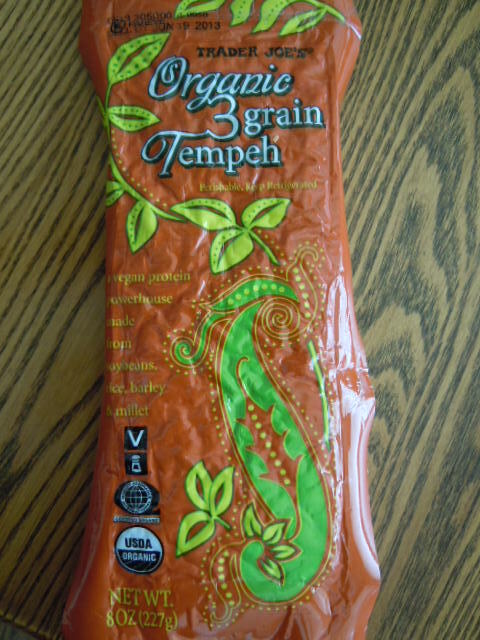 I have been buying my tempeh at Trader Joe’s but its also available at Whole Foods, health food stores and some grocery stores. You will find it in the refrigeration section along with the tofu products. I have used it in place of ground beef in chili, soup and casseroles. It’s super filling and takes on the flavors of what you put with it. I run it across a box type grater (aka a cheese grater) to give it texture before cooking with it. Are Tofu And Soybean Products Safe To Eat? This is a question that has been coming up a lot lately here on the blog. If you google the question you will find a variety of answers and pros and cons supporting both sides. It can be really confusing. I urge everyone to do their own research, read about it and talk with your doctor about your own personal health and decide together if eating soy is a smart choice for you. Despite the abundance of scientific evidence demonstrating the benefits of whole soy foods, many people have been scared off from healthful foods like edamame by the anti-soy propaganda (lacking responsible scientific integrity) that continues to float around the internet. It is true that the nutrient-depleted isolated soy in protein powders and processed foods is likely problematic. And of course, I recommend steering clear of genetically modified soy, as its safety, phytochemical value, and environmental impact remain questionable. Soy is not a magic pill or a poison; it is simply a bean. One can’t argue with the data — the associations between minimally processed soy intake and reduced risk of cancers has been reported over and over again. There is real controversy here. However, one still should not eat lots of soy products, to the exclusion of other valuable foods. Variety is crucial for obtaining diversity in protective phytochemicals, and a variety of beans are health promoting, along with many other foods. So use good judgment, avoid processed foods, GMO foods and eat a variety of whole natural plant foods including beans such as black beans, chickpeas, lentils and enjoy some edamame, tofu and tempeh as well. 1. Hwang YW, Kim SY, Jee SH, et al: Soy food consumption and risk of prostate cancer: a meta-analysis of observational studies. Nutr Cancer 2009;61:598-606. 2. Yang WS, Va P, Wong MY, et al: Soy intake is associated with lower lung cancer risk: results from a meta-analysis of epidemiologic studies. Am J Clin Nutr 2011;94:1575-1583. 3. Kim J, Kang M, Lee JS, et al: Fermented and non-fermented soy food consumption and gastric cancer in Japanese and Korean populations: a meta-analysis of observational studies. Cancer Sci 2011;102:231-244. 4. Yan L, Spitznagel EL, Bosland MC: Soy consumption and colorectal cancer risk in humans: a meta-analysis. Cancer Epidemiol Biomarkers Prev 2010;19:148-158. 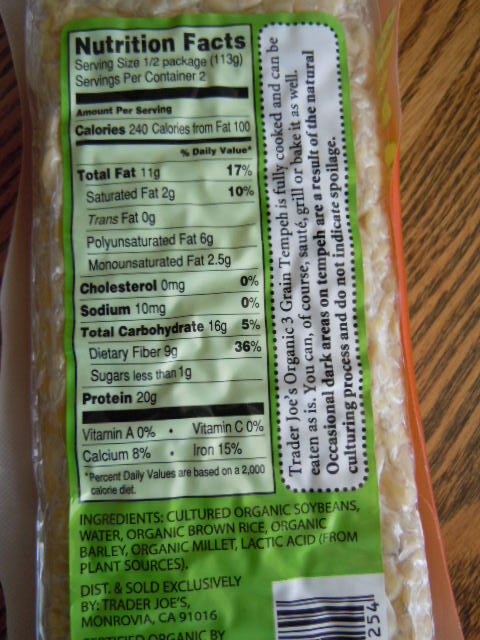 Also on the Dr Fuhrman website someone asked him if textured soy protein was safe to eat – like what is found in Trader Joe’s soy chorizo for example. His answer was that he still considers it to be like junk food but he didn’t believe it was harmful if eaten only occasionally. I have decided for me, that the whole soy bean in its natural state and non GMO, organic tofu, organic tempeh and even textured soy protein are safe to eat on an occasional basis as they don’t contain high amounts of IGF-1. I find these soy products to be filling, fairly inexpensive, loaded with protein and they add variety to our menu. It’s a personal decision and I urge everyone to research it and decide for themselves if they want to eat whole soy products or not. I hope you found this helpful! Thanks for being here. Please feel free to leave a comment or ask a question. How about you – Soy or No Soy? Do you find the recipe nutritional information and or weight watchers points helpful? I am trying to decide if I should keep calculating the nutritional information and the Weight Watchers Points for the recipes I post. It takes extra time to do it and if it’s not being used it could save me some work! Let me know. I like to avoid GMO, but gosh, how do you know without companies being forced to disclose they have GMO ingredients in them? In a perfect world, we could avoid all processed foods and foods we do not make ourselves and foods that we grow ourselves, but this is not a perfect world. The push needs to be for growers and companies to be made to disclose that their products contain GMO ingredients. It’s a big task for sure. You make some good points Renee. It is frustrating and like you I want to know if I am eating GMO foods. Thanks so much for this soy research! I read so many conflicting stories, it’s great to see this info. I’m glad you found it helpful Roz. The world of nutrition is confusing-everyone has their opinion and it’s difficult to know which way to go. Not sure what I think on the soy/no soy debate. I don’t follow weight watchers but I always look at the calories and carbs, fat, protein stuff. I understand if it is to much work though. Keep the nutrition and WW points…they are VERY helpful! Hi Gail – thank you for letting me know you want the nutritional information and the WW points. Nutrition info is interesting, but by the time I make my substitutions or account for differences in brands, I have to recalculate it anyway. Some soyfoods are made from whole soybean ingredients that do not require a processing step to separate the oil from the bean. Most tofu, tempeh, miso, tamari, soymilks, soy yogurts, and soy frozen desserts (made from whole soybean soymilk) as well as whole soy nutrition bars are examples of these products. To find out more information about the processing method your favorite soyfood utilizes, please contact the manufacturer directly. Please keep nutrition and WW stats! I find them to be very helpful. What a delicious looking recipe! I avoid highly processed soy and limit my intake to edamame, tofu and tempeh. Hi Jackie sounds like we are approaching the consumption of soy in the same manner. 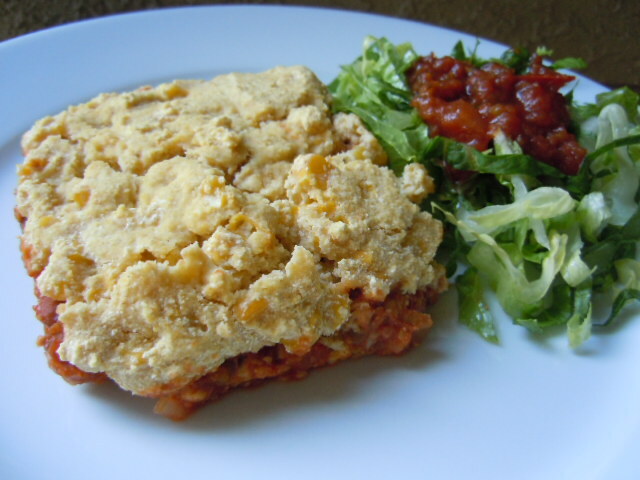 I will be making this Tempeh Tamale Pie again – I hope you give it a try!